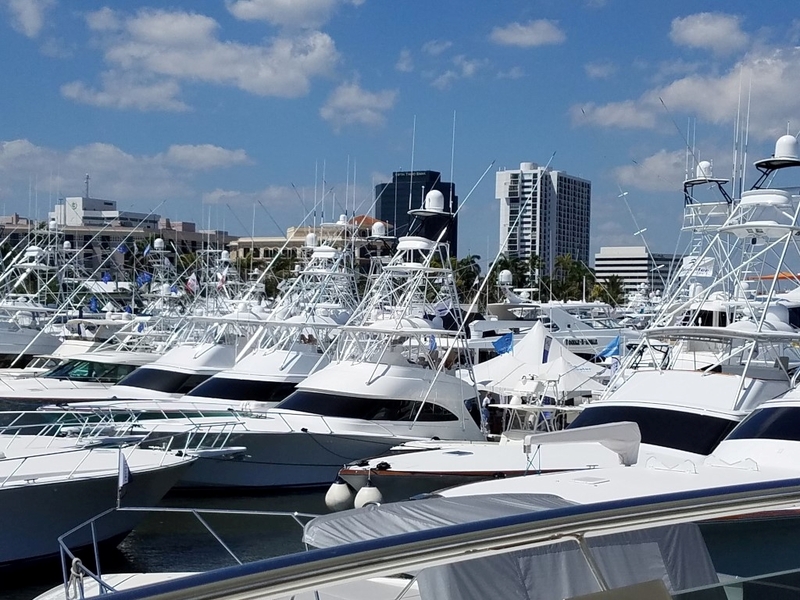 This past weekend Palm Beach County had its annual Boat Show. Over the years it has grown into on of the top five premier "in-water" show in the nation. Massive interlocking floating docks are assembled over a two week period and thousand of boats are brought; everything from a simple dingy to massive mega yachts over 150'. See my photo below and this web site to view additional photos including amazing shots inside the yachts. The show was very well attended due to the excellent weather and the day I attended was no exception - Temperatures in the low 80's and great access to all parts of the show including touring the yachts. I parked nearby in my downtown restaurant/shopping area and took a short trolley ride to the main show entrance. Waiting with her boyfriend was a very well dressed woman. So over dressed, however she was beautiful. I have attempted to recreate her outfit above and believe I nailed it, including shoes. Yes, it was that short and the boyfriend was taking photos while we were waiting for the trolley. She looked stunning and knew it. All of her detail matched and the coordination was perfect. Lots of planning and as the sayings goes - "An outfit to die for!" I love polka dots and was enthralled. Oh, and by the way, the boats were OK too. You are living the good life. I love it when a woman looks Fab & knows it. Friends Friday - Do I know you?